Late one night at a folk festival many miles from anywhere, the bar had been drained dry of Guinness by countless bearded folkies, and I found myself posed a difficult challenge. Musician Phil Beck had asked me to define exactly what Folk Music was exactly. I slurred something difficult to understand but after honestly trying to understand me, Phil instead offered a simpler definition; folk music is simply music people have never stopped singing. Folk music is, in short, music that people still want to listen to. 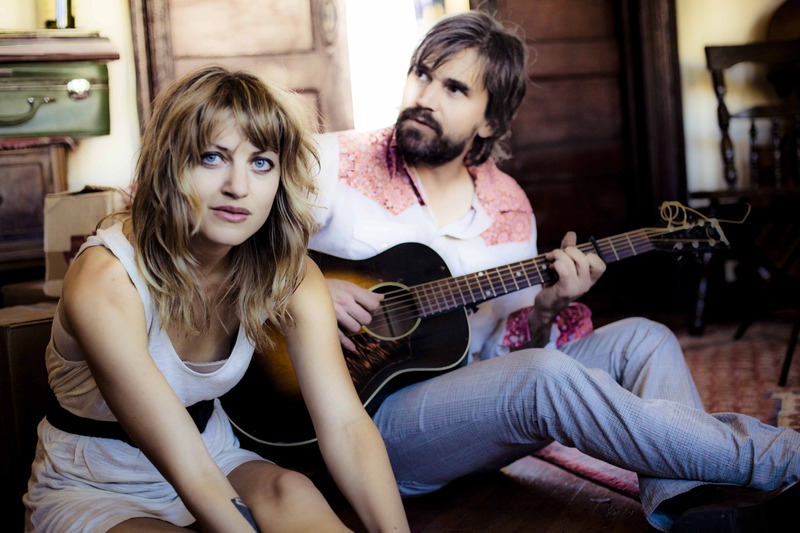 Child Ballads is the brand new Album from Anais Mitchell, this time teaming up with Jefferson Hamer. Although some of the songs do indeed feature themes of babies and children the album is actually named after Sir Francis James Child, from whose five-volume The English and Scottish Popular Ballads these seven songs are culled. The music is therefore not new, indeed you will have heard many of these songs in many guises before. The genius here is that these fresh arrangements and finely arranged harmonies, beguiling in their simplicity, offer something genuinely original. Lines written hundreds of years ago are made current, wounds reopened, magic rekindled and feuds renewed. Although these songs have crossed an ocean, and are played in a relaxed American folk style, the music has actually been strengthened by this displacement. Mitchell and Hamer have found a way to connect with each song and make it their own. Opening track “Willie of Winsbury” is a great English staple, heard many a time by this reviewer, yet here I found the many familiar voices coming to life in different and unexpected ways. The standout track for me is “Tam Lin” whose magic unfurls slowly and quite frankly stuns in it’s simplicity. Similarly, “Clyde Waters” sounds like it could have been written yesterday. Hamer’s more precise and somehow traditional intonation and Mitchell’s more modern and huskier tones lend a balance and weight to the stories here, and the production of the entire album is remarkably consistent – allowing the music to breathe. For the nu-folk listener; this is Trad you can play in public, and for the traditionalist – this is something that may surprise and delight. We’ve heard all this before. Many times. But I still want to listen. Child Ballads is out now from Wilderland Records. First Listen: Ben Harper with Charlie Musselwhite, Get Up! Those lucky enough to catch Ben Harper’s recent solo shows were treated to an eclectic mix of songs that showcased more than his exceptional song-writing, vocal and slide guitar talents. Audiences were given a peek behind the curtain into his life and process through covers of Eddie Vedder or Bob Marley songs, or or through stories of working with Jeff Buckley or Heath Ledger. A wide diversity of influences, a history rooted in the folk tradition and collaborations with many key artists of our time mean that audiences have come to expect a Ben Harper album to shift between rock, blues, roots, folk, funk and soul in a heartbeat, often within the same song. Get up! is Harper’s twelfth Studio Album, and follows last years By My Side. By My Side was referred to as a “retrospective” to accompany the solo tour, rather than a “Greatest Hits”, but when an artist has such a substantial body of work, any greatest hits style compilation can come to be seen as a full stop in a musician’s career, rather than an exclamation mark. Those afraid of a post-greatest-hits-lull will be dissapointed, as this collaboration with master harmonica player Charlie Musselwhite carves out new sonic territory for Harper and contains some great songs to boot. Opening track “Don’t look twice” is a standout, and blends a confident and understated vocal with a catchy, rumbling bass and remarkably restrained harmonica from Charlie Musselwhite, it also sets the tone for an album firmly rooted in blues. Tracks like the gorgeous “All that Matters Now” or aggressive “blood side out” stick close to the traditional blues formula, but modern arrangements and wonderful harmonica hooks stop them becoming stuck in an old-time blues rut. Title track “Get Up” is a great title track, not only because it’s a great song but because it best exempifies the feel of the entire album. Here a bubbling baseline and restrained percussion fuels lends this track a 70’s psychedelic drive to the low-end, before a guitar break that first tickles at the subconscious, and then reinvents itself in the second break to haunt and pry at the edges of melody whilst the harmonica eggs it on. From here a game of musical cat and mouse ensues that seems to spontaneously avoid ever becoming a riff or tune – This is enjoyable modern blues from two masters of their craft, with the band (comprising Jason Mozersky on guitar, Jesse Ingalls on bass and Jordan Richardson on drums) providing a solid backbone for Harper and Musselwhite’s musical dialog. For this reviewer the highpoints of this album are in it’s less traditional arrangements, whereas the driving roadhouse-style blues of “I’m in, I’m Out, And I’m Gone” or the angry “I don’t believe a word you say” don’t really offer much that is new. If you are looking for the memorable folk alternative riffs of ‘burn one down’ or the magestic outpouring of ‘Morning Yearning’ you’ll find that here in more measured amounts, Get Up! is an album that stays firmly in blues territory, and has a sound all of it’s own. Harper’s vocals are set back in the mix a little and Musselwhite’s harmonica is restrained, confident and strong throughout – here’s an artist who knows how to play as part of an ensemble. Perhaps because of Musselwhite’s contribution, Get Up! is truly an album where vocals, slide guitar and harmonica are given shared responsibility in pulling the tracks together and songwriting is given a back-seat to a joyful explosion of musicianship. Whilst this album seldom strays from the blues, Harper’s eclectic musical loves and broad array of inspirations means there is little here that feels formulaic or stale. A worthy step in Ben Harper’s continuing journey, Get Up reinforces that Harper is a musician at the top of his game, with many suprises left in store. Get Up! is available now. Ben Harper and Charlie Musselwhite will be appearing at this year’s Bluesfest. Roaming around the National Folk Festival is a delight to the senses, at every turn there is something new to taste, wild clothing or handmade instruments to play, the smell of a hot cider or mulled wine and, of course, wonderful music emanating from both buskers and from the many venues spaced around the Canberra site. In an effort to be heard above the din, the artists plaster all available surfaces with posters advertising their performing times. After, one-too-many alcoholic ginger ales I found myself staring at a wall of such posters, and amidst a sea of images depicting violins, guitars and banjos, the unexpected image of a Shamisen led my eye to fasten on the poster advertising George Kamikawa and Noriko Tadano. The small venue of the Flute and the Fiddle was packed for the performance I saw, with many standing on chairs at the back to get a glimpse. Those walking past couldn’t see the performers, but many were dancing anyway. I’m pretty sure they would have been surprised to see just two performers on stage. Energetic blues, played on slide-guitar and harmonica by George Kamikawa, combined with the unusual percussive punch of Noriko Tadano’s shamisen created a surprisingly full sound, adding a sort of folky, bluegrass feel to the solid country-blues arrangements. The banter between the duo and the crowd, and their energy and rapport on stage kept the crowd moving along with them. This is perhaps not surprising from two such seasoned performers. George has honed his performance the hard way, by busking and playing smaller venues since moving to Melbourne in 2001. Noriko Tadano has been playing Shamisen since she was 6 years old, but her ability to cross styles has meant she’s played with numerous blues and jazz artists. Since they joined forces, the Melbourne duo have won both numerous awards and critical acclaim. The show is called “East vs. West”, which is perhaps an accurate description of a musical style that blends Japanese and American sounds, but to this audience member there’s something very Australian about the mixing of cultures and musical styles. While the act may now rely on exposing the clash of cultures, there is real music being made here, and I hope they continue performing and evolving together. If you haven’t seen them yet, this duo is a must see at a festival (or street corner) near you! The ever-cosy Vanguard was transformed into a giant living room last week as Jack Carty Launched his new Album One Thousand Origami Birds. The room felt intimate as Carty arrived on stage to begin his set to a chorus of cheers and applause. The assembled crowd had already been treated to the beautiful sounds of Emma Davis, who shared some of her great song-writing to begin the evening. I hadn’t heard much of Carty’s music before the gig, but it seemed as though I was in the minority, with family and friends assembled en masse to celebrate the launch. From his first song, “One Thousand Origami Birds” the title track to the album, it was clear we were in the hands of a confident performer. Catching up before the gig, mates were trying to explain Jack Carty’s sound by referencing other artists, but I was pleased that his blend of heartfelt, tender vocals and confident finger-picked guitar wasn’t that easy to describe. Perhaps a little rooted in blues, Carty’s first song combined a playful energy and instrumentation with a solid, yet slightly vulnerable vocal that instantly held the crowd in thrall. A cavalcade of guest performers supported Carty through the set. Elana Stone’s Amazing vocals on “Grey Sky” were a highlight, as was excellent backing vocals on a number of the tracks by younger brother Dashiel Carty. As Leroy Lee carried his Banjo off stage Carty apologised for his determination to play the album in order, but you got the feeling that the musicians were enjoying it every bit as much as the man with the microphone. “Hope” was a highlight of the set for me, with a building energy and a folk-pop refrain with enough moments of silence to make it dynamic, mixing sadness and loss in equal spades with the faith. Gutsy live songs like “Hey You” and “Valentina” were unapologetic fun, an opportunity for the performers and crowd to really loosen up. “Them There hills” also stood out to me, lyrically a very folky/country song, the assembled musicians got the old Vanguard light fittings rattling with great stompy percussion, strident banjo and and live energy pushed along by Jack’s soaring vocals in the chorus. Like the live performance, the album itself is also confident and just a little relaxed. In fact, whilst the vocal energy of the live performance has been captured here, it does feel that the tempo on some of the more energetic songs has slowed. In contrast, slower songs like “The Tempest” that already sounded great live gain an extra weight, depth and closeness. Another example is the more judicious use of reverb on “Levies” which again feels close and intimate. The superb “There’s a Hole in Me Darling” is a great track to conclude the album, and, like the live performance, it is in the dynamics where Jack Carty impresses; a strong, yet vulnerable vocal combined with a delicate piano that builds to a crescendo and then falls back to silence. At the end of the gig, for an encore, Jack, his brother and his father got up to belt out a rousing (and damn accomplished!) version of Dylan’s “Rock Me Mama/Wagon Wheel”. It was a fitting end to an energetic and joyful gig. Whilst I feel that not all of this energy makes it onto the more considered recording, One Thousand Origami Birds is a well-rounded album that encompasses the beauty and much of the energy of Jack Carty’s live performance, and also offers it’s own unique insights, particularly in its more contemplative moments. I’ve ‘Been Listening’ to Johnny Flynn’s new album, and I like what I hear. It’s somewhat strange that with the revival in popularity of the folk scene that Johnny Flynn has seen very little of the media spotlight here in Australia. Indeed, although Johnny Flynn and his band the Sussex Wit have been doing the rounds a lot longer then fellow folksters and touring partners Mumford and Sons, Flynn’s unique music hasn’t shared the exposure his contemporaries have enjoyed. Things look set to change on the Australian scene at least, with Flynn confirmed to perform on these shores in early August. Laura Marling completionists may initially pick up this album because of her appearance in the duet ‘The Water’, but what they’ll discover is a complex and refreshing album from one of the UK folk scenes most accomplished artists. The opener ‘Kentucky Pill’ is a joyful, optimistic track with confident and tight production that instantly feels more polished and ‘poppy’ than anything we’ve heard before, fueled largely by an energetic drum beat and childhood reminiscences that sweep away any preconceptions of a “Johnny Flynn” sound. The second track ‘lost and found’ opens with a riff reminiscent of ‘shore-to- shore’ from A Larum (2008), allowing Flynn’s unique vocal qualities to shine, with subtle and gentle harmonies that feel much more connected to his previous work. Trumpets take front and centre in the catchy ‘Churlish May’, which paves the way for the bluesy ‘Been listening’ with a gorgeous electric guitar riff that put me in mind of the Pixies. At this point in my first listen I can confess that I was completely in love with the album. Lyrically, Flynn always gives me just enough to want to know more and from the line ‘a Kentucky pill and a cow-tipping expedition’ we know that this as album of stories, some of which are strange and difficult to comprehend and others like the excellent ‘Barnacled Warship’ or the ‘The Water’ which appeal more to the senses. A real treat is ‘Sweet William part 2’, which reprises the EP of late last year. Sweet William is a favorite track if mine, and this new version, which sounds far more raw and under-produced when compared with the rest of the album, is a jam-band reprise, a snapshot in time of something that sounds as though it has evolved through many live performances…and feels like it will continue on moving and growing long after this recording. At first listen ‘Amazon Love’ seems at odds with the rollicking start of the album, particularly as it follows the energetic ‘Agnes’. This slow, hopeful track couldn’t sound further from the buoyant ‘Kentucky Pill’, yet it is in this track that we hear Flynn at his most poetic. Harking back to A Larum’s softer moments, ‘Amazon Love’ seems to gather all the threads and ideas of ‘Been Listening’ together and steer the entire album home. Been Listening is an album that encapsulates it’s creator’s obvious delight in all the tastes, sights and sounds of life, and fans will find much that us familiar, and much that is new. Those coming fresh to Flynn’s sound will go on a not-altogether- predictable journey, and encounter an energetic and inspired travelling companion in Johnny Flynn. I may never forgive myself for missing Akron/Family’s only ever Sydney gig at the Annandale Hotel in December, the first time this mid-west American nu-folk band has visited these shores. Blogged reviews of Akron/Family gigs paint pictures of wild jam-band revelry, folk-inspired psychadelia and a wild, unhinged energy. In their 2009 Album, Set ‘Em Wild, Set ‘Em Free, Seth Olinsky, Miles Seaton and Dana Janssen have crafted something that moves effortlessly from chaotic prog-rock clatter to haunting folk harmonies that begins simply in the hills and rivers around their hometown of Williamsport, Pennsylvania and grow to embrace an energetic and spiritual new America. It is an album that doesn’t necessarily flow from one track to another, but instead the ideas seem to bounce and jumble together in a sort of unified cacophony. For me the standout track “The River” seems a kind of call-to-arms, an awakening. It is typical of an album that signals the re-emergence of the band since vocalist Ryan Vanderhoof left the group in 2007. Folk music is about sharing, and Akron/Family’s folk sensibilities have also spawned “Woody Guthrie’s America”, an on-line project inspired by the legendary folk icon that asks people from across America to share their story by learning the same song, and uploading their unique version to the web. Music as a means of storytelling is not new, but the ‘Woody Project’ gives us a hint of the kind of digital campfire that we might use now and in the future to grow and develop our own folk stories. Rest assured that the next time they visit these shores, tour dates will be posted prominently on these pages!